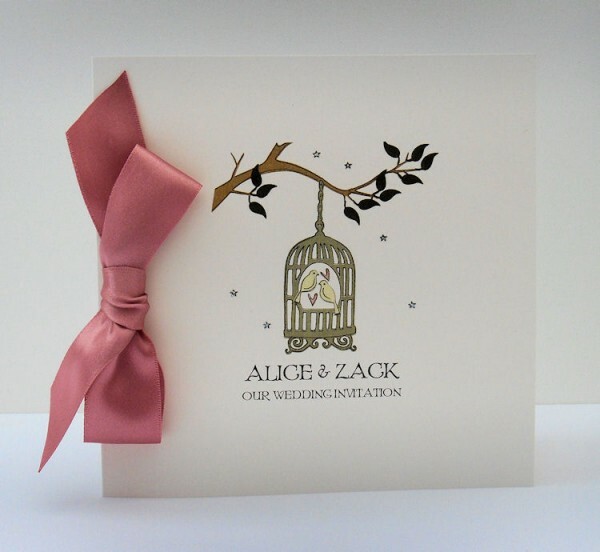 This delightful birdcage wedding invite from Bunny Delicious features one of Zoe’s trademark hand drawn illustrations. The subject matter is less quirky than some of her other designs but it follows the same style which makes it perfectly unique nonetheless. Shown here with a luscious dusky pink ribbon, the delicately drawn vintage birdcage is home to two love birds and hangs from a leafy branch. A twinkling of stars in the background and the tiny hearts surrounding the birds give the design a romantic Italian feel. As with all Bunny Delicious designs the ribbon is available in a number of different colours (cream and blue versions are shown in the supplementary images opposite) or you can dispense with the bow altogether and save a few pennies in the process. Visit the Bunny Delicious Pinterest page for this design because it is best place to see a showcase of some of the other Birdcage themed items in their collection. You can then click through from Pinterest to Bunny Delicious for pricing and further information.